RUSH: And you think there is sexual harassment in the United States, in the United States Congress and Hollywood, wait ’til you hear what they’re doing in Cuba. And of course Fauxcahontas. Can you believe this? I happen to love this. I am cracking up watching this. It is quintessential Trump. The only thing wrong with it is that it’s allowing the media to cover it and not stay focused on Al Franken and John Conyers and all the others, but still there’s a reason for it. It’s classic Trump. It’s quintessential Trump. The media still hasn’t figured it out so I, once again, will explain. I will try for I don’t know how many umpteenth times I’ve done this, to explain Donald Trump to the Drive-By Media. I don’t think they want to get it. I think they love this state of perpetual outrage in which they live, because I think they’ve convinced themselves that most of the rest of the country is in a constant state of personal outrage, and maybe they are, but not over the things the Drive-Bys are outraged about. The Drive-Bys are one of the primary reasons people are in a constant state of outrage. Anyway, it’s great to have you here. The telephone number is 800-282-2882, and the email address, I check subject lines. ‘Cause folks, I mean, not counting the spam, we get 10 to 12,000 emails during a show here. And it’s impossible for anybody to read them all, so I just randomly check subject lines. But I do check ’em. And that’s ElRushbo@eibnet.us. Now, the Havana Tribune is based in Miami — well, it’s not. The outlet reporting on this is based in Miami. And it notes that the children in the video — and there is a video, I’m not gonna bother you with it. I’ll just tell you what the line is. “The children in the video, mostly girls, ‘do not appear to be older than ten or 11.’ They are ‘Young Pioneers,’ children whose high grades in school force them into the Communist Party at an early age.” They are advanced intellectually supposedly so that they can earlier in life grasp the concepts of communism sooner than their classmates. “The video appears to have been published as a commemoration of Castro on the anniversary of his death.” Although the event occurred back in October, we’re just now hearing about it. 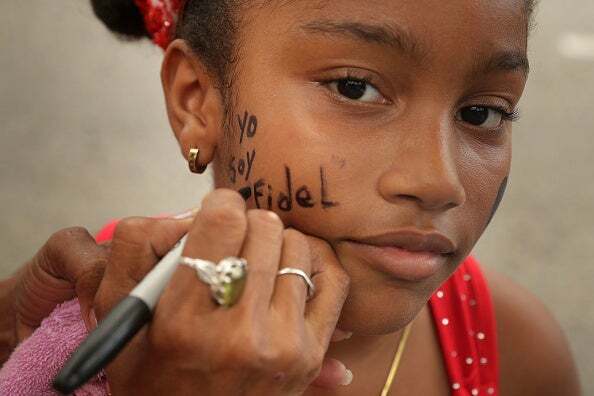 This is what young girls in Cuba are reciting on the death anniversary. Children forced to praise Fidel Castro as every girl’s boyfriend. Now, remember, Cuba and Venezuela, these are places that American liberals idolize. These are places American liberals dream about. The locations of several utopias. I wonder what the feminists would say about this and how they would excuse it.